American media conglomerate known as SFX, founded by Robert F. X. Sillerman, is attempting to use legal loopholes to invalidate the contracts between the promoters of Electric Forest festival and the festival grounds. In 2013 SFX tried to buy Insomniac (Owners of the Electric Forest Music Festival), and failed. SFX then turned their gun toward Madison House Presents, the other promoter of EFF and the originator of Rothbury fest. This also failed, and instead Madison House sold to concert promotion company AEG just recently. Now, SFX is trying to buy the land Double JJ Ranch, the home of Electric Forest. In attempts to invalidate the contracts AEG/Madison House/Insomniac has with the current owner of the ranch. 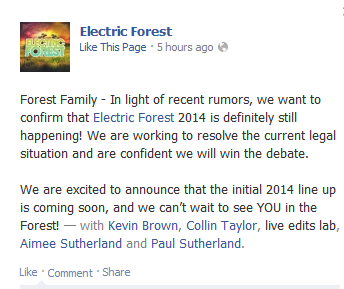 As EF has already sold 21,000+ advance tickets to the 2014 festival. AEG and Madison House have already paid $62,082.99 on the lease toward this year’s event and another $62,082.99 is due by Feb. 25. AEG says that if they lose control of the festival lease they will have to refund all of the advance sale tickets and their reputation along with that of the resort as a concert destination will be damaged. SFX Entertainment was born in the 1990s with a business model surrounding the acquisition and consolidation of local and regional concert promoters into a single national corporate entity. With big names like Tomorrowland and Electric Zoo already owned by the conglomerate, Electric Forest is not the only festival that SFX has gone after in the past.